Hopefully PerlDuck will post an answer. 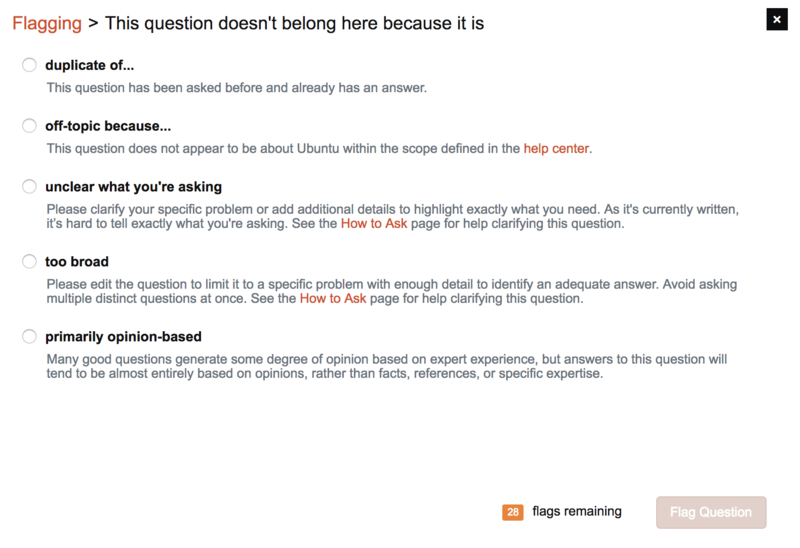 My second screenshot in this meta answer doesn't really look right, because I made it on Stack Overflow which is styled different from Ask Ubuntu, because I have too much rep on Ask Ubuntu to make it here. (I could log out, but then I couldn't flag at all.) Can someone with less than 3000 rep make a screenshot of that? I can add the freehand red circle. Am I right to suggest they post their own answer? I think the new problem is closely enough connected with the original one for it to be reasonable to regard it as the same problem, but maybe I am misinterpreting the error message in their comments. Unless I'm missing something, this seems to be a dupe. Similar situation here. This one would likely have been duped earlier, but it looks like nobody but the answerer looked up what wireless chipset the OP's laptop model has. Seems OT. Otherwise, it's unclear. I doubt there's a site that has scraped all of YouTube or that, if it did, would manage to stay in operation very long (even assuming no complaints, its operating costs would be uge!). But aside from that, the question is a webapp request, and while I don't think we should consider all webapp requests off-topic or too broad, it's unclear what their actual requirements are, considering that YouTube does actually seem to work for most Ubuntu users. (Related) Can we ask for more information here beyond what they've provided? @EliahKagan what's with the comments about Flash? YouTube doesn't need Flash, does it? @EliahKagan this one ^, right? Yes, that one. Excellent -- thanks!! I'll add a freehand red circle and edit it into my meta post shortly. @Zanna No, YouTube has not required Flash for quite some time, God bless it. I think it may still be possible to use Flash to watch YouTube. I am not actually sure about that. I haven't done so in years. When support for HTML5 video was new on YouTube, it didn't work on all browsers on all systems and switching back to Flash was a reasonable alternative to solve some problems. I'm not 100% sure that it is not sometimes a reasonable troubleshooting approach, but this is the first I've heard of installing Flash to make YouTube work, in a long while. Meta post edited. Thanks again! @Zanna I think we have a lot of questions that are more like forum posts than that one is. ...Like the very general question about how to bulk rename files that people like voting to dupe things to! :) Anyway, we don't actually have to wait for PerlDuck. In particular, if you're prepared to write a good answer that covers that material, I'd say you should totally go ahead. @Zanna I did end up flagging that other one for migration, btw. what should be done here? Well, they're two different package management errors, right? My guess is that neither is an error that takes place in Emacs or in the Ruby interpreter. I'm not sure if these are separate errors, but I'd guess they may be. Asking the OP to ask about their other problem separately, as you've done, makes sense to me. You might mention that, if they think the two errors are really different aspects of the same problem, then they should edit their question to explain that. But if they don't, or if they're not sure, then it's better to post about the other one separately. And under these circumstances -- where one of them is probably simple and probably adequately answered already -- I'd say they should almost definitely post a separate question. Well is that a problem? If it's correctly closed as a dupe, then it's not a problem for anyone else, really. As for them, perhaps they actually did solve both problems. Is there a reason to be concerned, that I haven't noticed. I would wait longer, in case they do come back and edit it. An edit now would prevent their subsequent edit from placing it in the reopen queue, wouldn't it? I'm not sure. What's the threshold? So this is the last day for it? Do you (by which I mean, anyone here) think I should keep this comment until 18.04 is released, or is it better that I just delete it now that the question is reopened? I mean, if you feel like it. But this isn't actually the same room as the old Ubuntu Regulators room, is it? I can view that room's transcript and it's still titled Ubuntu Regulators. That was the start of the history. On Ubuntu 17.04 all the shortcuts are working fine in GNOME, but in Unity they are not working. I cannot open terminal or change language with keyboard shortcuts. First of all, it's about EoL 17.04. But there is an accepted answer with 2 upvotes. I don't think the core of the answer would do any help to solve OP's problem. If the answer helped OP, I reckon it's just because of the last step of the answer: "Log Out --> Log On" i.e. it might very well be a no-repro. The core of the answer seems to be a red herring imo. @Zanna it was the same error, kinda. One happened from terminal and other from software-center. @jokerdino oh... is that the error you get from software-center when apt needs to reinstall something but can't find an archive for it? I was the one to close vote it first. @pomsky thanks for bringing it up. did you see my query to find answers by a user that got merged to a different question? noooo! why delete? the whole point of merging is to bring different good solutions to the same problem together isn't it? is it possible to find which of my images are uploaded to imgur and not stack.imgur? should those images be re-uploaded? @jokerdino depending on unity-webapps-common just broke utt. Can't install now because of a broken dependency chain. webapps-common -> webapps-services -> webapps-container. Or maybe it's just a PPA I have somewhere. I gues when you or another human reports, it I don't have to reply with tp, do I? Yeah, it's not necessary to reply with tp for those. Should I also report NAA posts to Natty (provided they're clearly NAA), if Natty doesn't seem to have caught them? Do I have that power? Nat allows everyone to report, but blacklists users after 5 wrong reports. Does it blacklist for giving feedback, too? I take it the last 15 reports had not all been true positives? There were just 2~3 fps. Other edit needs second rejection. Apparently that edit is not an audit, but it's... really bad. It replaces terms with other terms in a seemingly random way, turning correct claims into wrong ones. It replaces a term in a URL for a Wikipedia article with another one, causing the link to go to a not-found page! @Natty wait, why was that missed? I'm not convinced this question is off-topic, but I do think it's unclear until more information is given (see comment). This does not seem too broad. Can we tell what the problem was from the information in the question here? If not, then it's no-repro (see OP's answer).